The clouded leopard is named after the distinctive 'clouds' on its coat - ellipses partially edged in black, with the insides a darker colour than the background colour of the pelt. The base of the fur is a pale yellow to rich brown, making the darker cloud-like markings look even more distinctive. The limbs and underbelly are marked with large black ovals, and the back of its neck is conspicuously marked with two thick black bars. The clouded leopard is a medium-sized cat, 60 to 110 cm long and weighing between 11 and 20kg. It does, however, have an exceptionally long tail for balancing, which can be as long as the body itself, thick with black ring markings. The clouded leopard has a stocky build and, proportionately, the longest canine teeth of any living feline. Well adapted to forest life, the clouded leopard also has relatively short legs and broad paws which make it excellent at climbing trees and creeping through thick forest. It can climb while hanging upside-down under branches and descend tree trunks head-first. Clouded leopard (Neofilis nebulosa). Clouded leopards are heavily hunted for their teeth, bones and unique coats. The clouded leopard is a WWF priority species. WWF treats priority species as one of the most ecologically, economically and/or culturally important species on our planet. And so we are working to ensure such species can live and thrive in their natural habitats. The clouded leopard is found across Southeast Asia and the Himalayas in the following countries: southern China, Bhutan, Nepal, northeast India, Burma, Thailand, Vietnam, Malaysia, Cambodia, Laos, and Bangladesh. It is believed to be extinct in Taiwan, China. 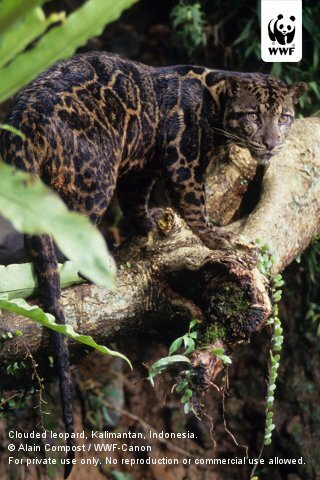 The clouded leopard's habitat is part of the Borneo Forests region, which is a WWF global priority region. 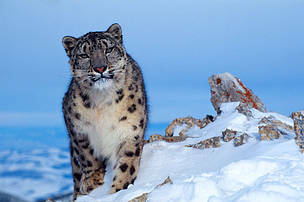 What are the main threats to the clouded leopard? 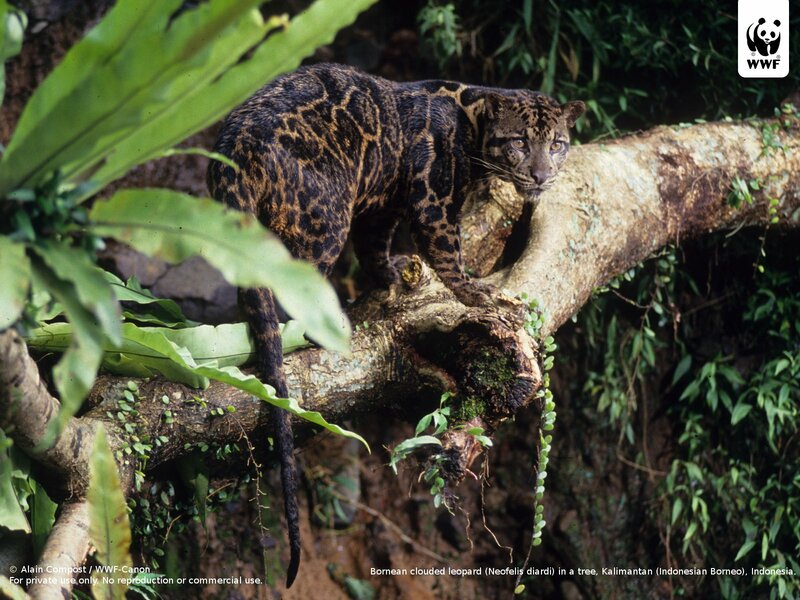 Deforestation in the tropical regions of Southeast Asia is the most serious threat to the clouded leopard. The species natural habitat has been fragmented and decreasing at a rate of 10% per year since 1997. The clouded leopard is widely hunted for its teeth and decorative pelt, and for bones for the traditional Asian medicinal trade. 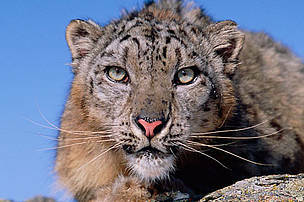 Clouded leopard pelts have been reported on sale in markets in China, Burma, Laos, Vietnam, Cambodia, Nepal and Thailand. They have also been featured on the menu of restaurants in Thailand and China which cater to wealthy Asian tourists. Like many other big cat species the clouded leopard is often killed as retaliation for killing livestock. 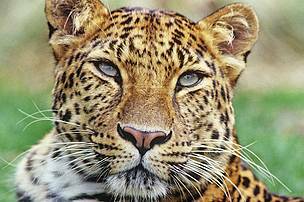 Learn more about human-leopard conflicts. 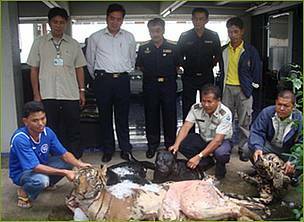 Mr. Anusit Kanjanapol (standing, centre) leads the Royal Thai Customs Officers team who confiscated 205kg of tiger, clouded leopard and panther carcasses which would have fetched US$17,650 on the black market. To protect clouded leopards and other big cats in Bhutan, WWF and local wildlife authorities are working together to establish anti-poaching units and strengthen anti-poaching law enforcement. In addition to poaching, WWF and its partners are addressing human-wildlife conflict by setting up a compensation fund for local farmers whose livestock is often killed by tigers and leopards. 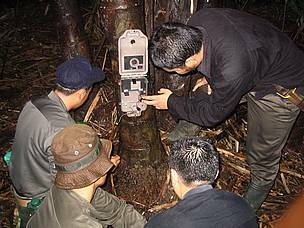 WWF and other organisations are using camera traps to better understand clouded leopards and assess their conservation status. Adopt a clouded leopard (WWF-US) to support conservation work to protect this species. The clouded leopard has the proportionately largest canine teeth of any member of the feline family. 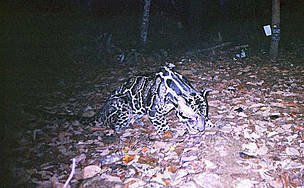 In 2007 it was found that the clouded leopard on Borneo is a different species to its relative on the Asian mainland. The clouded leopard can climb while hanging upside-down under branches and descend tree trunks head-first. The Borneon clouded leopard (Neofelis diardi) found in Sumatra, Borneo, and Java is a distinct species and not a sub-species.